Velobind spines are available in three lengths. For Use With Hot Knife Machine. Welcome to MyBinding video. 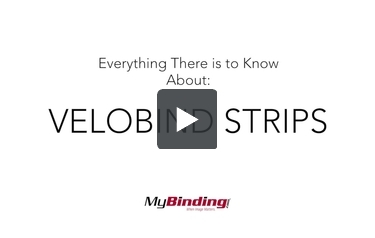 This is everything you need to know about Velobind Strips. First off there are 2 kinds of strips – the 11 pin and 4 pin. This video describes both. The 11 pin is a permanent solution, which means no adding or removing pages easily. It requires a compatible machine to bind your book together. The hot knife system cuts off the extra pin length and melts the ends together to hold your pages in. The 11 pin has several different colors to choose from and it comes in 3 different lengths. The 11 inch is your standard for all colors and is the most popular. There’s also a selection for 3 different widths. If you make a mistake, there is a special debinder tool. However, it ruins the binding and it requires to rebind the book with a new Velobind. The 4 pin Velobind can be bound without a machine, though it requires properly punched paper still. There’s a special tool that binds and debinds or you can purchase a machine to do it for you. There are fewer colors to choose from with the 4 pin and only 1 length and only 1 width but it makes up for it in its simplicity and versatility. The look is similar between the two. The 11 pin has a bit more shine to it. The most notable visual difference is the back. The 4 pin has its pin still visible while the 11 has a professional finish. The 11 pin is a sturdy plastic and because of the number of pins, it has little bend. The 4 pin has a more pliable plastic and bending it comes with a less favorable result but that also depends on why you’re choosing it in the first place. And those are Velobind Strips. For more demos, reviews and how-to’s, go to MyBinding.com.